Ellen Ramsey Flutes, located in Longmont, is Colorado's premier full service flute specialty shop offering a large selection of instruments and services. 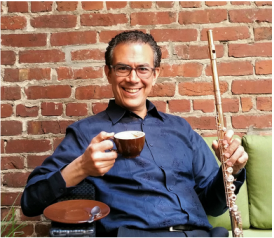 "We have opened up our beautiful performance space for recitals, masterclasses and events like this one with Marco Granados who is a Haynes artist. During this special event, you will be able to play test from a selection of Haynes flutes." *limited spaces available! masterclass tuition is $40/performers or $20/auditors for non-CFA members, $20/performers or $10/auditors for CFA members performing includes attendance to the evening concert! Register below! Register for one of Marco's Rocky Mountain classes! If you are choosing audit a class, you may answer "N.A." to the following questions, although all information is helpful!